Our Liquid Rubber franchise can offer excellent waterproofing systems to the mining and industrial communities. We have recently been awarded a SRI (Solar Reflectivity Index) rating of 101. The benefits associated with cool roofs include reduced cooling energy load, reduced air pollution and greenhouse gas emission, and improved human health and comfort. Cool roofs may extend the roof service life and help mitigating the urban heat island effect. HighBuild S-200 is a universal waterproofing product which is applied using a roller or for larger projects a piston type paint spray pump. HighBuild S-200 is a single component liquid elastomeric applied at ambient temperatures. It cures to a tough rubber like finish within 48 hrs. and forms a completely seamless and fully adhered membrane that prevents water penetration. HighBuild S-200 can be used in combination with SealRoof A-200 a waterproofing acrylic based emulsion where a coloured roof coating is desired. Once the HighBuild S-200 is applied and cured (48 hrs.) SealRoof A-200 is applied over the surface using a knit roller or paint sprayer. SealRoof B-200 is an ‘instant set’ membrane for waterproofing, flat, low-slope, and metal roof structures typically associated with commercial and industrial buildings, warehouses, apartment buildings and garage buildings. SealRoof B-200 contains no solvents and is applied at ambient temperatures with no hot kettles or open flame, making it ideal for government buildings, schools and hospitals. Where fire retardancy is required for a roofing structure, Liquid Rubber SealRoof F-100 combines waterproofing, and fire retardant properties in one single liquid applied flexible coating. Cured, Liquid Rubber SealRoof F-100 meets UL Class A standards. HighBuild S-200 is a versatile repair product for patching leaks in roofs, repairing cracks along parapet walls and flashings and sealing around roof penetrations associated with skylights, rooftop air conditioners, and pipe work. HighBuild S-200 is an effective sealant to repair eaves troughs. Liquid Rubber SealRoof A-200 gives old concrete and wood surfaces a like-new finish, protecting them from water damage. Available in a variety of colours, Liquid Rubber SealRoof A-200 is a single component easy to use liquid coating that cures in 24 hrs and provides a tough weather resistant finish with good wear properties. For areas where greater traction or less slick finish is desired, Liquid Rubber CreteSafe T-150 an acrylic emulsion containing specially graded grits is the choice. Liquid Rubber CreteSafe T-150 provides a non-slip surface for new and old patios, decks and balconies. Applied using a knitted roller, Liquid Rubber CreteSafe T-150 provides an even fully adhered textured finish which fills minor cracks and pits in concrete surfaces, giving an attractive and functional finish which resists damage from sunlight, water, oils, and greases. Liquid Rubber CreteSafe B-250 is a spray applied instant setting waterproof coating for concrete block or poured foundations. Applied directly to the foundation, it forms a seamless, fully adhered rubberized membrane that will not let water in, and being an elastomeric coating will bridge cracks that often form as foundations settle. Liquid Rubber CreteSafe B-250 contains no solvents so can be applied over ICF. For foundation and concrete structure repairs HighBuild S-200 is applied using a conventional roller or in combination with geo textile fabric seals cracks and waterproofs and seals joints. Liquid Rubber CreteSafe B-400 is a trowel applied sealant used for filling cracks. Both HighBuild S-200 and CreteSafe B-400 are applied as liquids and cure within hours to form a strong adhesive bond which waterproofs and protects. Liquid Rubber CreteSafe A-150 gives old concrete surfaces a like-new finish, protection from water , oil and grease damage. Available in a variety of colours, Liquid Rubber CreteSafe A-150 is a single component easy to use liquid coating that cures in 24 hrs and provides a tough weather resistant finish with good wear properties. For areas where greater traction or less slick finish is desired, Liquid Rubber CreteSafe T-300 an acrylic emulsion containing specially graded grits is the choice. Liquid Rubber CreteSafe T-300 provides a textured surface which fills minor cracks in old pavements. Applied using a knitted roller, Liquid Rubber CreteSafe T-300 provides a fully adhered protective coating which resists damage from rain and sun. HighBuild S-200 is a cost effective sealant for planter boxes, green house floors and pans, and an effective waterproofing liner for pools , watercourses and ponds. Containing no solvents and VOC free, HighBuild S-200 is environmentally and work place safe. HighBuild S-200, CreteSafe A-150 and CreteSafe T-300 provide corrosion protection, water protection and a decorative functional finish for fences, concrete and wood retaining walls. Concrete and wooden walkways are protected and enhanced with Liquid Rubber CreteSafe T-300 where a non-slip surface is desired. Liquid Rubber MetalSafe B-300 is an effective 100% seamless and fully adhered bridge deck waterproofing product which is applied in liquid form and cures to a tough flexible membrane. Combining adhesion and elasticity, this bridge deck waterproofing coating resists cracking, peeling and water permeation. Liquid Rubber MetalSafe B-300 is asphalt based, and elastomer modified compound that strongly adheres to asphalt hot-mix. Being spray applied at ambient temperatures, the cured membrane is seamless and does not contribute to VOCs, and meets all safety standards. High performance seamless fully bonded waterproofing membrane ideal for sandwich construction between primary and secondary linings of sprayed concrete bored tunnels. Liquid Rubber CreteSafe B-250 , a spray applied liner, waterproofs cut and cover tunnels, buried structures for vehicle, pedestrian traffic, and mine tunnels. Liquid Rubber CreteSafe B-250 protects against water ingress, chlorides and sulphate corrosion. Liquid Rubber CreteSafe B-250 is an elastomeric membrane designed for application in confined spaces, having no odour, or VOCs and curing rapidly. Liquid Rubber CreteSafe B-250 can be spray applied between primary and secondary layers of sprayed or cast concrete in tunnels and forms an excellent bond to both the substrate and subsequent cementitous materials applied onto it once cured. Liquid Rubber CreteSafe B-250, CreteSafe B-150, and CreteSafe A-150 surface coating and pond liners are elastomeric spray on coatings with excellent durability, excellent flexibility, abrasion resistance, and high chemical resistance. 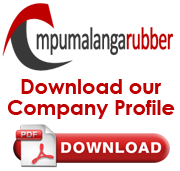 Different formulas have been developed to cover a very wide variety of requirements from surface hardness to elongation. The liners can be applied over a wide range of plastic and geo textiles creating a fully adhered and seamless membrane to prevent leaks. also be applied over polyethylene or PVC sheeting sealing seams and providing a leak resistant seamless liner. On containment walls Liquid Rubber CreteSafe B-250 protects the concrete surface from water, waterborne and chemical contaminants. Its low permeability, excellent adhesion and elasticity make it ideal to prevent water damage and bridge stress cracks in the concrete. Designed to be used in confined spaces, Liquid Rubber SealRoof F-100 provides waterproofing and a fire retardant coating for underground maintenance and other building structures. Liquid Rubber SealRoof F-100 meets UL fire ratings and has exceptionally low flame spread and smoke generation as well as being safe to apply, containing no solvents or VOCs. To control corrosion on piping and ventilation equipment, Liquid Rubber MetalSafe B-300 and HighBuild S-200 provide excellent adhesion to metal are easy to apply by brush or airless spray system and easy to maintain. Both resist under-cutting, blistering and peeling, are workplace safe to apply and are cost effective. These protective coatings are equally effective for protecting new metal surfaces and stopping corrosion progression on existing rusted surfaces. Liquid Rubber SealRoof B-200 applied as an ‘instant-setting’ fluid applied membrane provides cost effective waterproofing for all types of roof construction. Sprayed using a high volume – low pressure pump system, contractors can waterproof 500 m² of roof surface per day. The cured Liquid Rubber SealRoof B-200 membrane resists damage from water, acid rain, sun’s ultraviolet radiation and wind. Liquid Rubber SealRoof A-200 can be applied as a topcoat over SealRoof B-200™ where an energy efficient colour roof waterproofing membrane is desired. Liquid Rubber SealRoof F-100 is a flexible liquid applied membrane combining waterproofing performance with fire retardant properties in a single coating. Applied over concrete flooring in process and warehouse facilities and chemical containment areas, Liquid Rubber CreteSafe A-250 and CreteSafe T-300 provides a protective wear-resistant coating which resists acids found in mineral extraction processing. Applied over worn flooring Liquid Rubber CreteSafe A-250 fills cracks and damage areas, restoring a new floor look. Where greater traction is required, Liquid Rubber CreteSafe T-300 containing a ‘grit’ additive, is recommended. Both coatings are salt and oil resistant. Liquid Rubber A-Primer is applied as a topcoat over either Liquid Rubber CreteSafe A-250 or CreteSafe T-300 enhances resistance to staining and tracking. Liquid Rubber MetalSafe B-300 easily adheres to any metal surface including low carbon steel, galvanized metal, and rusted metal. Liquid Rubber MetalSafe B-300 creates seamless waterproof barrier on metal surfaces and is an excellent guard against corrosion: both preventing rust on new surfaces and preventing further corrosion on already affected areas. Liquid Rubber MetalSafe B-300 is safe to apply is non-flammable and is water-based containing no solvents. Liquid Rubber MetalSafe B-300 can be used as the finish coating or can be part of a two-part system using a topcoat of Liquid Rubber SealRoof A-150 to provide a tough coloured surface. Spray or brush applied Liquid Rubber products protects ferrous metal support members from rust and corrosion by completely sealing the surface from air and water. Liquid Rubber MetalSafe B-300 is resistant to ultraviolet radiation, water and airborne acids. A liquid applied coating, Liquid Rubber MetalSafe B-300 and HighBuild S-200 can seal the most complex structural geometries. Liquid Rubber SealRoof F-100 in addition to providing corrosion protection provides valuable resistance to metal fatigue during a fire event, giving first responders time to save valuable assets. Liquid Rubber MetalSafe B-300 a fast drying surface tolerant elastomeric coating that can be hand or spray applied to wire brushed rusty steel surfaces. Used for above and below ground pipelines, structural steel, bridges, tanks, and other steel surfaces. A solvent free two-component high performance coating, MetalSafe B-300 is applied with conventional airless spray equipment. HighBuild S-200 a high build single component cold applied liquid bituminous coating. Used for corrosion protection of buried pipe, flanges, valves and fittings and can be hand applied to girth welds, tie-ins, fittings and rehabilitation of existing pipelines. Liquid Rubber SealRoof B-200 applied as an ‘instant-setting’ fluid applied membrane provides cost effective waterproofing for all types of roof construction. Sprayed using a high volume – low pressure pump system, contractors can waterproof 500 m² of roof surface per day. The cured Liquid Rubber SealRoof B-200 membrane resists damage from salt water, acid rain, sun’s ultraviolet radiation and wind. Liquid Rubber SealRoof A-200 can be applied as a topcoat over SealRoof B-200 where an energy efficient colour roof waterproofing membrane is desired. Liquid Rubber SealRoof F-100 is a flexible liquid applied membrane combining waterproofing performance with fire retardant properties in a single coating. Applied over concrete flooring in process and warehouse facilities, Liquid Rubber CreteSafe A-150 provides a protective wear-resistant coating in a range of colours. Applied over worn flooring Liquid Rubber CreteSafe A-150 fills cracks and damage areas, restoring a new floor look. Where greater traction is required, Liquid Rubber CreteSafe T-300 containing a ‘grit’ additive, is recommended. Both coatings are salt and oil resistant. Liquid Rubber A-Primer is applied as a topcoat over either Liquid Rubber CreteSafe A-150 or CreteSafe T-300 enhances resistance to staining and tracking. Liquid Rubber MetalSafe B-300 provides excellent adhesion to steel, protecting the surface from corrosion caused by salt and water exposure. Spray applied in the liquid form, it cures producing a fully adhered, seamless membrane conforming to and sealing even the most complex structural shapes. For protecting concrete retaining walls from water and salt damage, Liquid Rubber CreteSafe B-250 provides a tough weather resistant membrane which resists damage from the sun’s UV rays. Both products combine ease of application with workplace and environmental safety. Liquid Rubber MetalSafe B-300 (spray applied) or HighBuild S-200 (brush applied) provide a tough waterproof and corrosion protective coating with excellent elasticity. Liquid Rubber MetalSafe B-300 applied alone or in combination with Liquid Rubber MetalSafe A-300 provides an excellent corrosion protective liner for cargo holds and bilges. Extensive ASTM testing has shown these coatings resist under-cutting, blistering and peel-back, and are resistant to a wide range of chemical products. Liquid Rubber MetalSafe A-300, is resistant to swelling in the presence of hydrocarbons. All Liquid Rubber spray applied liner products feature excellent adhesion and elasticity, allowing the cured coating to bridge small stress cracks in tank surface. For walking surfaces where good traction is required, such as wet and oily decks and companionways, select Liquid Rubber CreteSafe T-300 an easy to apply and clean non-skid coating. Applied to the exterior hulls of vessels, Liquid Rubber MetalSafe B-300 and MetalSafe A-300 protects the metal surface from rust and corrosion and improves maintenance associated with surface fouling. The coatings ability to resist under-cutting, prevents corrosion damage going undetected around damaged surfaces and its low surface tension properties, limits organism growth and makes anti-fouling significantly easier and safer. The rubberized and elastic properties of these products combined with their resistance to UV, salt and water damage, make them the ideal choice for metal protection in off-shore drilling and production platforms. These coatings are easily and safely applied using an airless spray system in the dry dock facility and can be easily repaired at sea, using only a brush or paint roller. Their rubberized nature resists impact damage and facilitates bridging stress cracks and other metal fatigue problems. Liquid Rubber SealRoof B-200 applied as an ‘instant-setting’ fluid applied membrane provides cost effective waterproofing for all types of roof construction including metal. Sprayed using a high volume – low pressure pump system, contractors can waterproof 500 m² of roof surface per day. The cured Liquid Rubber SealRoof B-200 membrane resists damage from salt water, acid rain, sun’s ultraviolet radiation and wind. Liquid Rubber SealRoof A-100 or SealRoof A-200 can be applied as a topcoat over SealRoof B-200 where an energy efficient colour roof waterproofing membrane is desired. 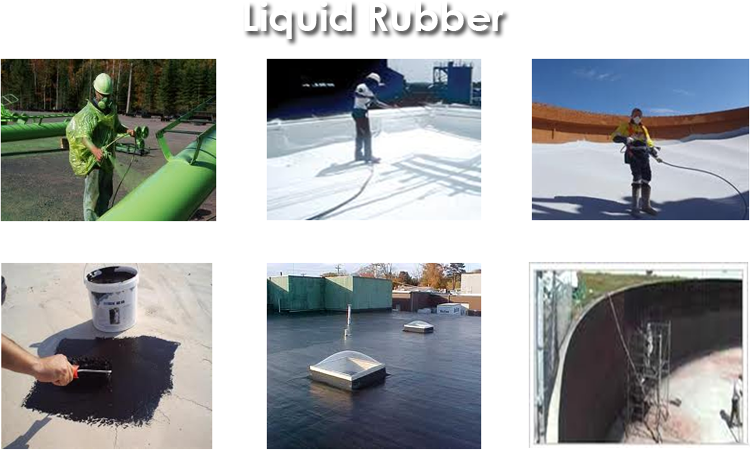 Liquid Rubber SealRoof F-100 is a flexible liquid applied membrane combining waterproofing performance with fire retardant properties in a single coating. Liquid Rubber CreteSafe B-250 and CreteSafe A-250 surface coating and pond liners are elastomeric spray on coatings with excellent durability, excellent flexibility, abrasion resistance, and high chemical resistance. Different formulas have been developed to cover a very wide variety of requirements from surface hardness to elongation. The liners can be applied over a wide range of plastic and geo textiles creating a fully adhered and seamless membrane to prevent leaks. On containment walls Liquid Rubber CreteSafe B-250 protects the concrete surface from water, waterborne and chemical contaminants. Its low permeability, excellent adhesion and elasticity make it ideal to prevent water damage and bridge stress cracks in the concrete. Applied over concrete flooring in process and warehouse facilities, Liquid Rubber CreteSafe A-150 and CreteSafe T-300 provides a protective wear-resistant coating which resists acids found in mineral extraction processing. Applied over worn flooring Liquid Rubber CreteSafe A-150 fills cracks and damage areas, restoring a new floor look. Where greater traction is required, Liquid Rubber CreteSafe T-300 containing a ‘grit’ additive, is recommended. Both coatings are salt and oil resistant. Liquid Rubber A-Primer is applied as a topcoat over either Liquid Rubber CreteSafe A-150 or CreteSafe T-300 enhances resistance to staining and tracking. Liquid Rubber MetalSafe B-300 easily adheres to any metal surface including low carbon steel, galvanized metal, and rusted metal. Liquid Rubber MetalSafe B-300 creates seamless waterproof barrier on metal surfaces and is an excellent guard against corrosion: both preventing rust on new surfaces and preventing further corrosion on already affected areas. Liquid Rubber MetalSafe B-300 is safe to apply is non-flammable and is water-based containing no solvents. Liquid Rubber MetalSafe B-300 can be used as the finish coating or can be part of a two-part system using a topcoat of Liquid Rubber SealRoof A-200 to provide a tough coloured surface. SealRoof F-100 in addition to providing corrosion protection provides valuable resistance to metal fatigue during a fire event, giving first responders time to save valuable assets. For cement block or poured concrete foundations, Liquid Rubber CreteSafe B-150 and CreteSafe B-250 provide a seamless and fully adhered waterproof membrane. Both products are a two part elastomeric emulsion which sets instantly enabling rapid backfilling. Being an emulsion based product, CreteSafe B-250 and B-150 contain no solvents and can be applied to ICF foundation structures. A worker safe product, Liquid Rubber CreteSafe products are non-flammable, non-toxic and applied at ambient temperatures. Liquid Rubber CreteSafe products can be used to waterproof and protect all types of concrete form soil born chemicals and is not affected by soil bacteria.